The GI system includes a number of highly specialized cell types, each differentiated to perform a specific function. Most of the listed cells are epithelial, since variously specialized epithelia carry out most of the functions which are specific to the GI system. Other tissues are also vitally important to GI function, but are basically similar in all organ systems and are not individually listed here. See separate pages for smooth muscle, for cells of connective tissue (including immune system), and for nerve cells. Absorptive cells, or enterocytes, are the predominant epithelial cell type lining the lumen of the small intestine and colon. These cells are specialized for absorption of nutrients across the apical plasma membrane and export of these same nutrients across the basal plasma membrane. Upon release at the basal end of the cell, nutrient molecules diffuse into connective tissue space and eventually into capillaries or lacteals of the lamina propria. The apical surface area of each absorptive cell is greatly increased by evagination into a dense array of microvilli, visible microscopically as the brush border. In the small intestine, brush border enzymes contribute to digestive breakdown (these enzymes are lacking from absorptive cells of the colon). The microvilli are supported by an underlying meshwork of microfilaments which comprise the terminal web. At the lateral edges of each cell, the the terminal web reinforces the junctional complex that attaches adjoining cells. (This site is sometimes visible microscopically as a terminal bar at the apical corners of each cell.). A pale (poorly stained) region above the nucleus indicates the location of the Golgi apparatus, where some absorbed nutrients are processed for transport. Associated cell types: Interspersed among the many absorptive cells of the intestinal epithelium are scattered goblet cells, occasional enteroendocrine cells (which are difficult to distinguish in routine preparations), and occasional wandering cells of the immune system (e.g., lymphocytes, eosinophils). The life-span of absorptive cells is short, only a few days. During this time, the cells migrate from deep in crypts, where they are formed by dividing stem cells, to the surface epithelium where they eventually undergo apoptosis. Along villi, this migration is sometimes called "the epithelial escalatory". Look for apoptosis at the tips of villi. Consult your histology textbook and/or atlas for additional detail and electron micrographs of these cells. 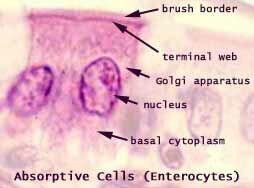 Goblet cells are scattered among the absorptive cells in the epithelium of the small intestine and colon. These epithelial cells are specialized for secretion of mucus, which facilitates passage of material through the bowel. The name "goblet" refers to the cell's shape, narrow at the base and bulging apically. The apical end of each goblet cell is occupied by a large mass of mucus, which compresses adjacent cells (thus conferring the characteristic "goblet" shape) and displaces the nucleus toward the basal end of the cell. As in other mucous cells, the nucleus is compact and intensely-stained. Goblet cells comprise an integral part of the epithelium, attached by junctional complexes (evidenced in light microscopy as the "terminal bar") to adjacent absorptive cells. The proportion of goblet cells to absorptive cells increases along the entire length of the bowel, with relatively few in the duodenum and very many in the colon. The colonic epithelium gives the superficial impression of being almost entirely goblet cells, but there are still several times as many absorptive cells. 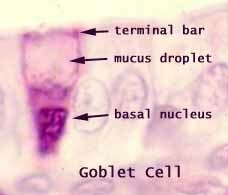 The goblets are just more conspicuous, with their bulging mucus droplets. Epithelial cells which are specialized to secrete mucus are called mucous cells. In routine light microscopy, mucous cells are most conspicuously distinguished by their "empty" appearance (i.e., poorly stained cytoplasm) and densely-stained, basal nuclei. The nucleus in a typical mucous cell gives the impression of having been displaced and compressed by the mass of mucus accumulated in the apical end of the cell. Mucus does not stain well with standard acidic or basic dyes, but is demonstrated with the Periodic Acid Shiff procedure (PAS stain). Examples of mucous cells from the GI may be found in salivary glands, esophageal glands, stomach surface, and Brunner's glands of the duodenum. Goblet cells, which stand alone within a surface epithelium, are a characteristic feature of the intestine (as well as the respiratory tract and the female reproductive tract). Serous cells, exemplified by pancreatic acinar cells, are glandular epithelial cells specialized for exocrine enzyme secretion. A serous cell's cytoplasm is visibly polarized, with basophilic basal cytoplasm and variously-staining secretory vesicles (zymogen granules) concentrated in apical cytoplasm. The basal basophilia is due to a concentration of protein synthetic organelles (ribosomes on rough endoplasmic reticulum). The Golgi apparatus is usually located midway along the cell, typically in a supranuclear position. Examples of serous cells include acinar cells of pancreas and salivary glands, gastric chief cells, and intestinal Paneth cells. 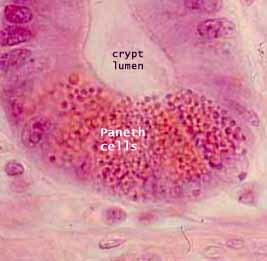 Paneth cells are secretory epithelial cells located at the ends of intestinal crypts. The function for these cells is secretion of anti-bacterial proteins into the crypt lumen, thereby providing protection for the stem cells which line the crypt walls. For recent research news concerning the protective functions of Paneth cells and intestinal mucus, see Science 334:182 (2011), "Keeping bacteria at a distance". 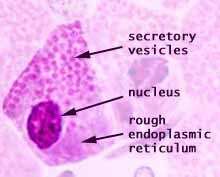 Paneth cells have typical serous-secretory appearance, with basophilic basal cytoplasm (containing protein-synthetic rough endoplasmic reticulum) and apical secretory vesicles (zymogen granules). The secretory vacuoles of Paneth cells contain lysosomal enzymes, with anti-bacterial function. Myoepithelial cells are contractile epithelial cells which forcibly express the contents of a gland. Although myoepithelial cells function like smooth muscle, they are typically located within a glandular epithelium, between the secretory cells and the basement membrane. Each myoepithelial cell has long cytoplasmic processes which wrap around a secretory unit. Hence, contraction of the myoepithelial processes can squeeze secretory product from the secretory unit into its duct. Myoepithelial cells contribute significantly to the secretory activity of sweat glands, salivary glands, and mammary glands. In routine histological preparations, myoepithelial cells are inconspicuous. The cell body can sometimes be noticed as an "extra" nucleus beneath some secretory cells. The contractile process are thin eosinophilic strands. In routine H&E stained sections of sweat glands, these can often be seen as small pink triangles underlying the secretory cells. In sweat glands and mammary glands, myoepithelial processes are normally difficult to observe without special stains. For a nice image of myoepithelial cells (in breast) stained with immunoperoxidase, see WebPath. The sensation of taste is mediated by columnar epithelial sensory cells which occur in clusters called taste buds on fungiform and circumvallate papillae of the tongue. Taste buds interrupt and extend across the tongue's stratified squamous epithelium. These sensory cells are normally replaced every 10-14 days by division and differentiation of stem cells, which is handy since they are exposed and easily damaged (e.g., by a bite of too-hot pizza). 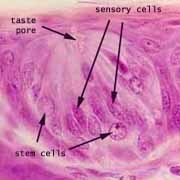 Associated cell types: In addition to sensory cells, the elongated cells of the taste bud include support cells, which are sometimes (rather pretentiously) called sustentacular cells (from the same root as "sustain"). Stem cells are normally visible in taste buds as shorter cells with round nuclei which appear at the basal end of the tastebud. The cellular structure of hepatocytes is correspondingly rich. Instead of displaying a concentration of one particular organelle, hepatocytes have lots of everything -- lots of mitochondria, lots of ribosomes, lots of Golgi bodies, lots of endoplasmic reticulum (both rough and smooth), lots of stored glycogen, lots of lysosomes, lots of plasma membrane (with microvilli on the free surface). They even have lots of nucleus (yes, hepatocytes may be polyploid and commonly have two full-size nuclei). When an introductory biology book illustrates "the cell", the representative example is often a hepatocyte -- because hepatocytes offer splendid and numerous examples of most cellular organelles. In appearance, hepatocytes are boxy (cuboidal) cells with one or two large euchromatic nuclei and with abundant, grainy cytoplasm that stains well with both acid and basic dyes (reflecting the abundance of various cellular constituents). Because individual liver cells have an indefinite lifespan, they may accumulate abundant lipofuscin (yellow-brown "wear-and-tear" pigment), especially with advancing age. Hepatocytes are arranged into cords, in which each hepatocyte is attached to its neighbors in a two-dimensional sheet. On either side of the cord, each hepatocyte faces the space of Disse, across which it communicates freely with adjacent sinusoids. Hepatocytes are epithelial, but their epithelial nature is expressed in a rather peculiar way. An ordinary epithelial cell sits on its basal surface, has an apical surface exposed to the external space, and is attached to its neighbors along its lateral surface. In principle, hepatocytes follow this same plan -- but they have a unique topology. A typical hepatocyte has two basal surfaces, on opposite ends of the cell where it faces the sinusoids on either side of the cord in which it resides. The apical surface of a hepatocyte occurs along a band around the cell's middle, half-way between the opposing basal surfaces. It is across this surface that bile is secreted. The edges of this apical surface are attached by junctional complexes to those of adjacent hepatocytes, thereby forming the bile canaliculi. These bile canaliculi form a network encircling each hepatocyte and sealed within the hepatic cord. Along this network (which is shaped like chicken-wire), bile can seep toward the periphery of the lobule and hence into the proper bile ducts which are found only portal areas. The lateral surfaces of a hepatocyte take the form of two broad bands which wrap around the cell between the two basal surfaces, separated by the narrow band of apical surface. These lateral surfaces attach the cell to its neighbors within the cord, with junctional complexes sealing off and separating the bile canaliculi (at the apical surface) from the plasma-containing space of Disse (at the basal surfaces). Endothelial cells are simple squamous cells which line the entire vascular system (including lymphatic channels). Endothelial cytoplasm is inconspicuous in routine light microscopy. Typically only the nuclei are visible, at the boundary between the lumen and the wall of a vessel. Endothelial nuclei typically appear thin and dark, in cross section. However, occasionally endothelium lies parallel to the plane of section. In this case the nuclei may appear very large, round, and pale. The term reticuloendothelial system refers to the macrophages of the liver, spleen and lymph nodes (i.e., those organs with elaborate endothelially-lined channels supported by reticular connective tissue). The name reflects former confusion about the distinction between endothelial cells and the scattered population of macrophages (monocytes, histiocytes). Macrophages can be readily labelled experimentally through their phagocytosis of injected carbon particles. However, endothelial cells are also labelled by the same procedure. Although endothelial cells are not dramatically phagocytotic, they do shuttle some materials across the endothelial lining via small endocytotic and exocytotic vesicles. Although endothelial cells appear rather uninteresting under the microscope, these are important cells. They are situated at a critical location, between the blood and all other body cells. They secrete substances which control local blood flow and blood coagulation, and they are active participants in white blood cell emigration during inflammation. Fenestrated endothelium. In a few special locations -- notably in the sinusoids of the liver, in the glomeruli of the kidney, and in most endocrine glands -- the endothelium is fenestrated (i.e., full of holes -- from fenestra, window). In the liver, where there is also no basement membrane, the fenestrations permit blood plasma to wash freely over the exposed surfaces of the hepatocytes through the space of Disse. Kupffer cells are macrophages found in the sinusoids of the liver. These cells have standard macrophage / monocyte specialization (i.e, receptor-mediated phagocytosis, lysosomal digestion). This particular population of macrophages are especially significant, with responsibility not only for cleaning bacteria out of the portal blood stream (the "dirty" blood" from the intestine), but also for removing worn-out red blood cells and recycling hemoglobin (a job shared with macrophages of the spleen). Kupffer cells are closely associated with the endothelial lining of the liver. Lying along side or draped across the liver sinusoids, the Kupffer cells are not easily distinguished from the endothelial cells. The term reticuloendothelial system refers to the macrophages of the liver, spleen and lymph nodes, i.e., those organs with elaborate endothelially-lined channels supported by reticular connective tissue. The name reflects former confusion about the distinction between endothelial cells and the scattered population of macrophages (monocytes, histiocytes). Macrophages can be readily labelled experimentally through their phagocytosis of injected carbon particles. However, endothelial cells are also labelled by the same procedure. Although endothelial cells are not dramatically phagocytotic, they do shuttle some materials across the endothelial lining via small endocytotic and exocytotic vesicles. Ito cells are stellate cells of the liver, located at intervals within the space of Disse. These cells function as storage sites for fat and vitamin A. Historical note: Although evidently included within Kupffer's original description of Kupffer cells, Ito cells comprise a distinct cell type (proper Kupffer cells are liver macrophages). The protective epithelial cells which line the surface of the stomach (including gastric pits) are called surface mucous cells. These cells are critical for resisting attack by digestive acid and enzymes. Any disruption of these cells' function can lead to an ulcer. See WebPath (low mag), WebPath (high mag), or Milikowski & Berman's Color Atlas of Basic Histopathology, pp. 240-241. The appearance of surface mucous cells is rather different from that other mucous cells. Their nuclei are not compressed basally (at least, not usually as much so as other mucous cells) and their apical mucus droplets show some affinity for eosin (i.e., pink-staining in H&E). These differences presumably reflect the fact that the mucus secreted by these cells has a special composition to resist digestion. Individual surface mucous cells also differ in shape from intestinal goblet cells. Since the mucosal surface of the stomach consists of these cells and no others, individual surface mucous cells cannot bulge apically like the goblet cells. Parietal cells (oxyntic cells) of the stomach secrete acid, by pumping hydrogen ions across the cell membrane. These are among the most dramatically differentiated epithelial cells in the body, with functional specialization reflected in their microscopic appearance. Parietal cells are relatively large cells, with one or two oval, centrally located euchromatic nuclei. The cytoplasm is strongly acidophilic, is somewhat grainy in appearance, and is typically less-intensely stained in a "halo" zone midway between the nucleus and the cell membrane. This cytoplasmic appearance is closely associated with the parietal cell's functional specialization for secreting acid. Pumping hydrogen ions against a tremendous concentration gradient (from pH = 7.0 to pH < 1.0) requires energy, which in turn requires mitochondria to produce ATP. [Consult your physiology references for additional detail about acid production by parietal cells.] Parietal cells contain so many mitochondria that the cytoplasm appears to be packed with these organelles, leading to the cells' characteristic acidophilia (mitochondria are acidophilic). The area of membrane surface across which ions may be pumped is substantially increased by a deep invagination into the cytoplasm (the so-called intracellular canaliculus). The surface area of this pocket is further increased by microvilli. Since the lumen of the canaliculus is extracellular, it contains no organelles and appears less intensely stained Thus the pale "halo" around the nucleus gives microscopically visible evidence of the canaliculus. Parietal cells may be found at any level in the fundic glands, but they are most common in the middle region. Chief cells of the stomach secrete the digestive enzymes (pepsins) of the stomach and have the typical appearance of serous-secretory epithelial cells. Secretory vesicles (containing pepsinogen) are clearly visible in the apical cytoplasm of chief cells. Basal cytoplasm is strongly basophilic (especially by comparison with parietal cells), due to the presence of the extensive rough endoplasmic reticulum that synthesizes protein for secretion. Chief cells may be found at any level in the fundic glands, but they are most common in the deeper region, toward the muscularis mucosae. Mucous neck cells of the stomach are inconspicuous epithelial cells with a typical mucous-secretory appearance. These cells are most common in the upper ("neck") region of the fundic glands (i.e., near to the glands' openings into the bottoms of gastric pits). Their specific function remains unclear. Mucous neck cells are difficult to identify in routine sections of stomach mucosa. When the cells are neatly cut from top to bottom, they can be recognized by the basally compressed (often wedge-shaped) nucleus and the stored mucus that fills the apical cytoplasm. But in other random planes of section, the poorly-stained mucus is inconspicuous and the nucleus can resemble any of the small dense nuclei found in lamina propria. Link to the endocrine system. Many of the body's cells secrete substances which influence other cells, either locally or at some distance. Cells generally regarded as endocrine cells are those which are conspicuously specialized for this function. The gastrointestinal system has two classes of such cells, the islets of Langerhans in the pancreas and the enteroendocrine cells in the mucosal epithelium of the stomach and intestine. Pancreatic islets are covered elsewhere. Enteroendocrine cells comprise a class of columnar epithelial cells, scattered individually among the absorptive cells and exocrine cells that line the mucosa of the GI tract. They are located most commonly in the necks and deeper in gastric glands and in the lower portions of intestinal crypts. Each type of enteroendocrine cell is specialized to secrete a particular hormone that influences gastrointestinal secretion or motility. Consult your physiology text for functional details. Enteroendocrine cells have traditionally been recognized by their affinity for certain metal stains, hence the older terms chromaffin cells (having an affinity for chromium) and argentaffin cells or argyrophil cells (having an affinity for silver). With sufficient resolution, these cells can sometimes be recognized in routine light microscopic preparations by their relatively pale cytoplasm with a broad base and a basal concentration of secretory vesicles (in contrast to the apical concentration of secretory vesicles for exocrine serous cells or mucous cells). Immunocytochemical methods are preferred for demonstrating and properly identifying the various types of enteroendocrine cells. Stem cells are undifferentiated cells which remain capable of cell division to replace cells which die. In the gastrointestinal tract, epithelial stem cells are essential to continually replenish the surface epithelium. Microscopically, stem cells lack distinguishing characteristics. However, their activity can be detected by the presence of mitotic figures, the intensely basophilic masses of condensed chromation which characterizes cells undergoing mitosis. Stem cells of the gastric mucosa are located at the at the top of the glands where they open into the pits. These cells are responsible for replenishing the secretory cells of the gastric glands and also the surface mucous cells that protect the stomach surface. These cells are difficult to notice and even more difficult to identify in routine histological preparations. Stem cells of the intestinal mucosa line the walls of the crypts and continually replenish the intestinal epithelium, completely replacing all the absorptive cells and goblet cells approximate once every four days. These cells are inconspicuous when resting, but mitotic figures (intensely basophilic condensed chromatin) are common and easily noticed in the crypts of the small intestine. The importance of stem cells in the intestinal crypts is illustrated by recovery from cholera. The cholera toxin kills the intestinal epithelium, leading to loss of bodily fluid across the mucosa, copious diarrhea, massive dehydration, and death within a few days. However, if patients can be kept hydrated for those few days, epithelial replacement by stem cell division will restore normal function. Stem cells of the oral cavity and the esophagus, like those of the epidermis, are located in the basal cell layer of the stratified squamous epithelium. Consult your histology or cell biology textbook for additional information about stem cells. Tuft cells are a less familiar cell type, distinct from absorptive cells, which have a tuft of microvilli extending into the lumen. New studies (published 2016 in Nature and in Science) have reported "an important role for tuft cells in promoting immunity against parasitic helminths or protozoa" [PERSPECTIVE: Science 351:1264-65].